There are a handful of truly dazzling luxury hotels in Jerusalem that offer everything you would expect from top five star hotels, but with unique Jerusalem flair and charm. After opening to much fanfare in 2016, the Herbert Samuel Hotel has already caused quite a stir in Jerusalem’s luxury hospitality scene. Not only does the hotel stand toe to toe with the city’s many big name luxury hotels in terms of rooms, service, comforts and amenities, but it is also home to the brand new Jerusalem branch of the famous Herbert Samuel restaurant of Tel Aviv, a household name in Israeli fine dining. The Inbal Jerusalem Hotel, or the Inbal as it is called, is often referred to as the American hotel for its predominantly American clientele. This luxury hotel in the upmarket neighborhood of Talbiyeh is unique in that it is terraced and built around a central atrium. The hotel boasts a leading health club and spa, a year-round swimming pool, and the popular Sofia Italian Restaurant. The Inbal is well located near trendy Emek Refaim street, picturesque Liberty Bell Park and the charming neighborhood of Yemin Moshe. A double room will cost around $500* per night. The Waldorf Astoria is the hotel to stay in if you’re looking for Park Avenue-style luxury, opulent architecture, and the most elegant accommodation. 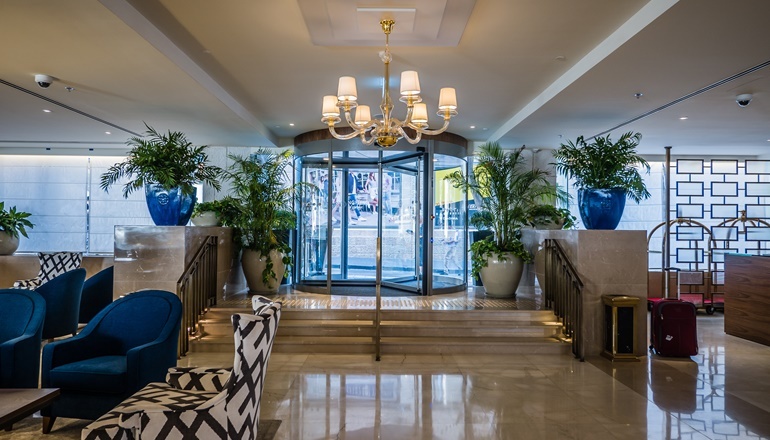 This luxury hotel is conveniently located on the intersection of King David and Agron Streets, right by upscale Mamilla Mall and not a far walk from Jaffa Gate and the Old City. The hotel features 226 stunning rooms, a full-service spa and health club and three fine restaurants. Room rates are estimated to be at around $500* per night. What sets the Mamilla Hotel apart is the way it fuses ultra-modern sleek minimalistic décor with elements of traditional Jerusalem design. This Jerusalem luxury hotel does not compromise on comfort despite its emphasis on the aesthetic and rooms come equipped with the finest facilities. Mamilla Hotel is known for its wide selection of eateries, from the Rooftop restaurant with its striking views of the Old City to the chic Mirror Bar where one can unwind with a cocktail or fine wine to hip sounds. The hotel features the luxurious Akasha Wellbeing Center with gym, exercise classes and workshops as well as spa treatments, an indoor pool and organic food lounge and bar. A room for two adults will cost around $500* per night. The David Citadel Hotel offers luxury accommodation but with an emphasis on comfort and warmth. The hotel is well suited for all types of travelers from those on a romantic getaway to business executives to families. David Citadel Hotel is renowned for its memorable views of the Old City walls and Tower of David and you get to take in these views while enjoying your lavish buffet breakfast spread or having a dip in the swimming pool. The hotel’s restaurants include a gourmet sushi bar. Those looking to unwind will love the feng-shui designed spa. A well-appointed room for two will cost around $580* per night. Probably the most famous luxury hotel in Jerusalem, the King David Hotel is distinguished for its old-world charm, elegance, impeccable service and celebrity clientele. Situated in a grand building, a landmark piece of Jerusalem history, the King David Hotel is not a far walk from both the Old City as well as the city center. The hotel offers a state of the art fitness center, a heated indoor pool, an outdoor pool and tennis courts in stunning cultivated gardens with a brilliant view of the Old City. A room for two will cost around $720* per night. Situated on the border between east and west Jerusalem, the American Colony Hotel offers luxury lodging with a unique Middle Eastern ambience. The hotel boasts a rich history, from the story of the building itself to the sumptuous interiors replete with beautiful antique furnishings. Popular with foreign diplomats and journalists, the American Colony Hotel features 86 luxurious rooms and suites and several celebrated restaurants that offer everything from Arabic food to afternoon tea with English cake and scones. Guests get to unwind in lush gardens, an outdoor heated swimming pool, a sauna and fitness center. A room for two will cost around $495* per night. *Room rates quoted are based on rates in April, 2013 and generally increase during high season (May – October and during religious high holidays).